When it comes to winter squash, I've come to the conclusion that, in general, my favorite way to prepare it is to roast it. And I like it best unpeeled. I love the deep, natural sweetness that comes to the surface... the edges turn golden... the skin turns pleasantly chewy... I am entirely happy just eating it like this. So really, what sets one roasted squash apart from the next roasted squash? The seasonings, of course. And the sauce. Ah yes, the secret's in the sauce. In this version, that salt-of-the-earth, sweaty-quality of cumin seeds is the accent. And throwing in some green onions to roast with the squash near the end. I actually think that I could triple the quantity of green onions in this recipe and still not have enough. Keep that in mind if you're a green onion-lover. 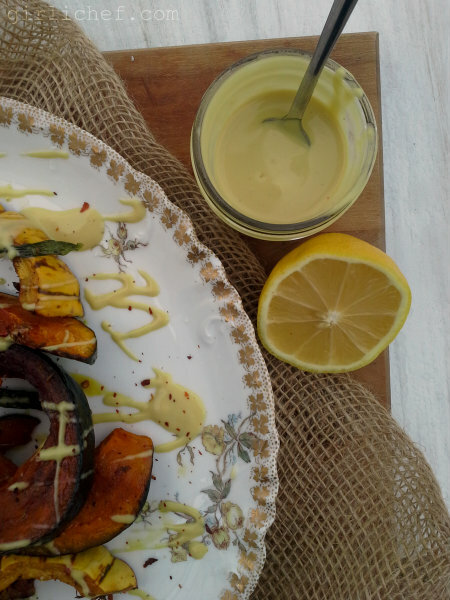 And then there's the creamy, tangy drizzle of lemon and tahini that finishes the whole thing off. You'll definitely want to pass this around and let everybody spoon more of it onto their own plates to swipe bites of squash through on the way to their mouth. I'm still feeling pretty darn proud of myself for ending this year on such a virtuous note. I credit that with turning to the exploration of winter squash (instead of holiday sweets...not that I didn't go there...just not as in-depth as I could have). Arrange oven racks into upper and lower thirds of the oven; preheat to 425° F.
Place the prepped kabocha on one baking sheet that has been lined with parchment paper. Place the prepped delicata on another. Drizzle about 1½ tablespoons of the oil over each baking sheet and then sprinkle with all but about ¼ teaspoon of the cumin seeds. Sprinkle with salt and pepper. Toss everything around so that all surfaces of the squash get lightly coated in everything. Slide into oven and roast for 15 minutes. Combine remaining cumin seed, 1 tablespoon of olive oil, and scallions in a smal bowl, and season with salt and pepper; toss to coat. Divide scallions evenly over squash and continue to roast until squash is tender (but not mushy), ~15 minutes more. In the meantime, put the lemon juice, tahini, and remaining 3 tablespoons of olive oil into a small jar with a tightly fitting lid. Add a pinch of salt and pepper. Screw on lid and shake like crazy until smooth and combined. 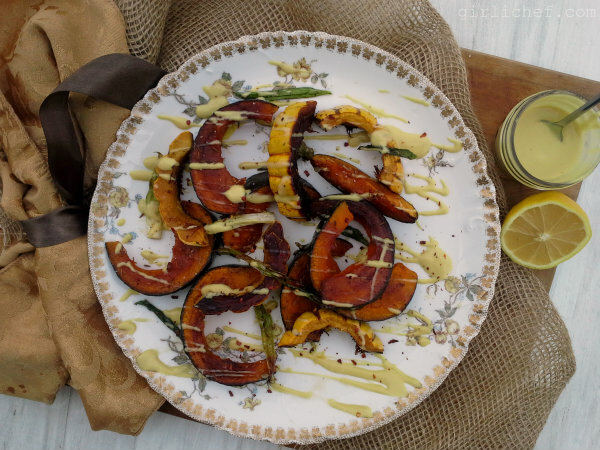 Put the squash and onions onto a serving platter and drizzle with the lemon-tahini dressing (as much as you like...hold some back to serve alongside, as well); sprinkle with crushed red chiles. This is already week #10 of 12 Weeks of Winter Squash! So, while it is the last one of 2012, we're heading into a new year to finish it out. 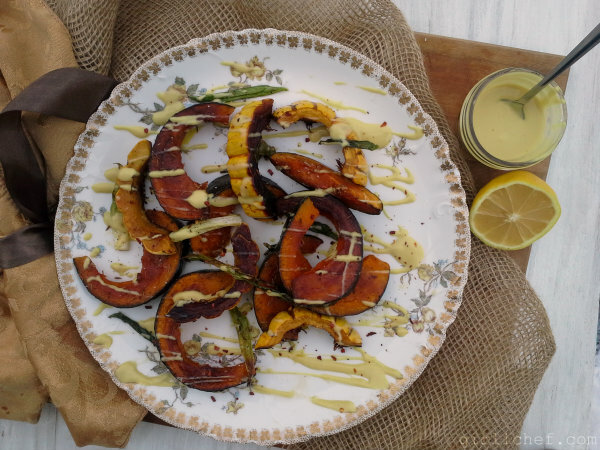 Be sure to stop by my co-host Joanne's place to see what she made with winter squash this week, and then share your own creations below. Wishing everyone a safe and happy New Year!